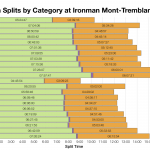 The final race of the weekend was Ironman Mont-Tremblant, the second year of the event and it’s first time as the Ironman North American Championship. The Championship status carries more relevance to pros than age groupers, but for the amateurs there was a healthy 75 Kona slots on offer. Mont-Tremblant also debuted one of the new SwimSmart initiative starts with athletes racing in waves starting a few minutes apart. 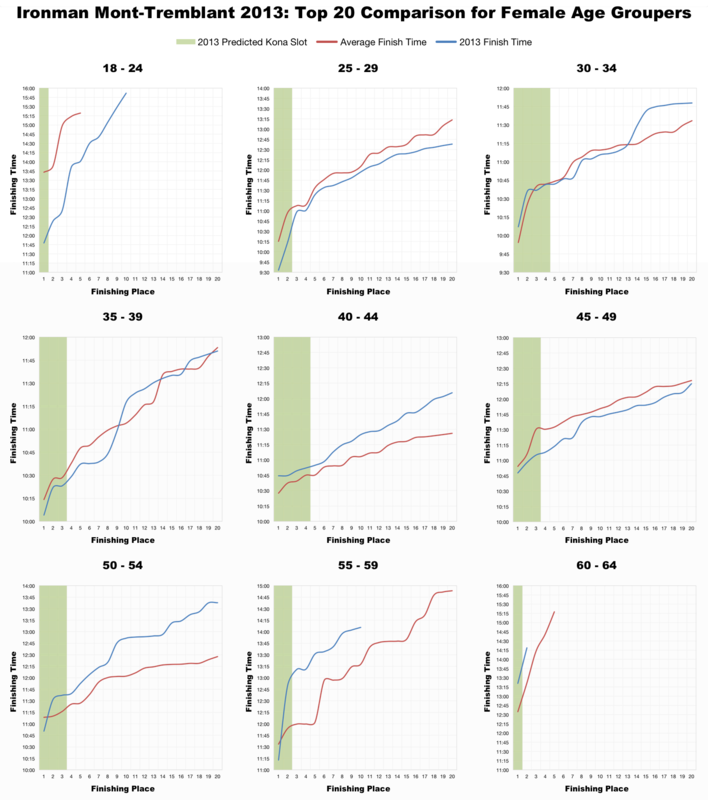 Examining the distribution of split times from this year’s race (top) and comparing with 2012 it’s clear that 2013 was the slower race. There is a far smaller proportion of finishers in the 10-12 hour region than in 2012, the result of both slower bike and run performances. The wave based swim also proved slower, but not by such a significant margin. 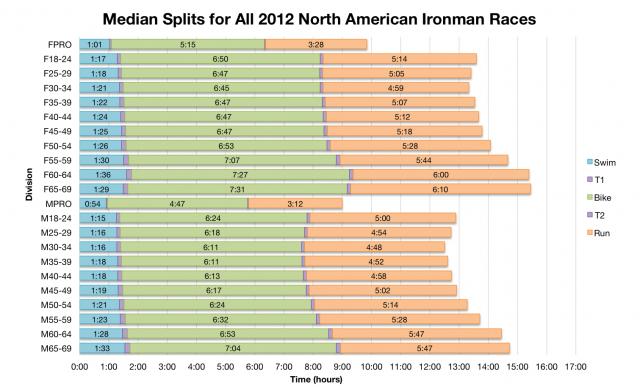 Comparing the splits against the distributions for all 2012 North American races shows that despite a slower year Mont-Tremblant falls in line with other US races. The results are the same when I compare the median splits from 2012 and 2013. 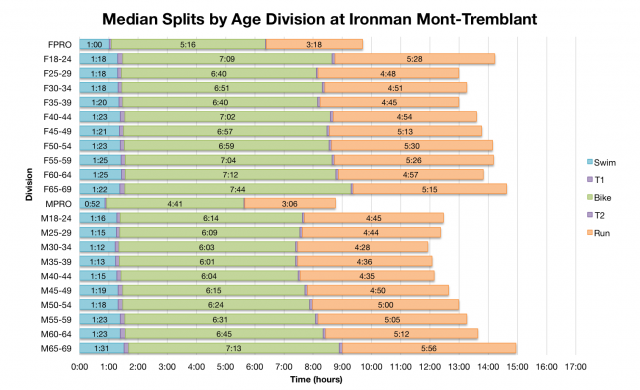 Last year was a faster day in Mont-Tremblant. Repeating the comparison with all North American races however yields a different result and Mont-Tremblant comes out a little faster than the broader averages. 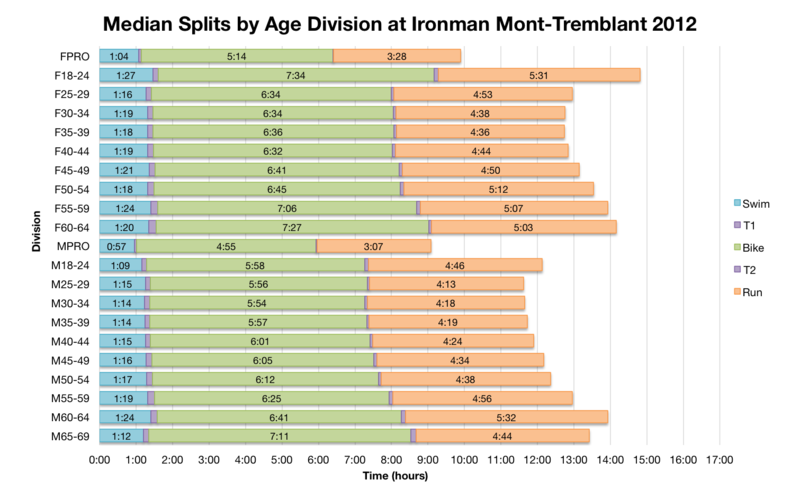 So Ironman Mont-Tremblant was slower than before, but perhaps a fraction faster than the North American averages. 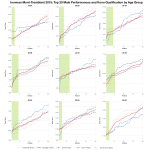 At the front of the field the performances of age groupers chasing Kona slots were largely comparable and the differences between 2012 and 2013 relatively small. Few age divisions were significantly faster this year, most the same or slightly slower. 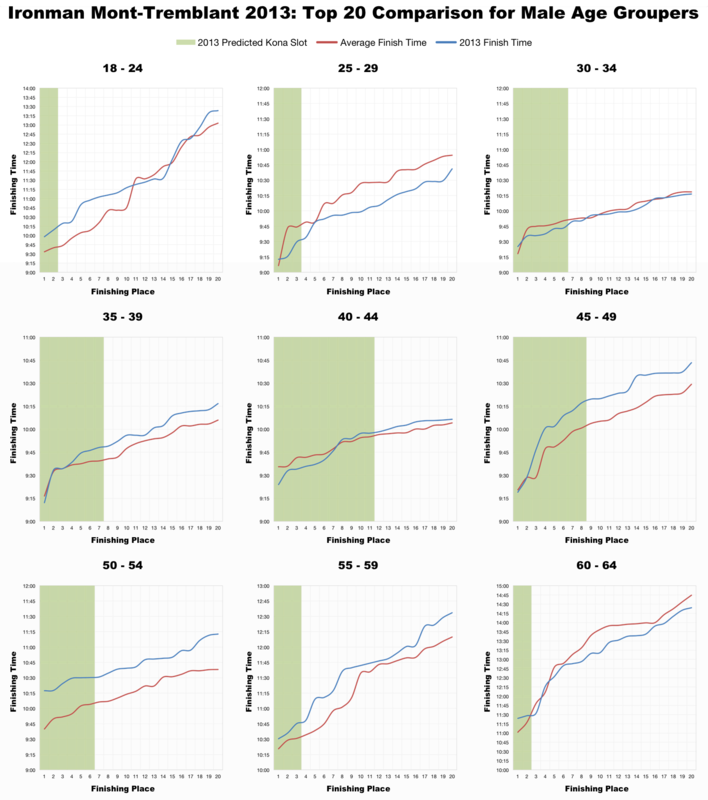 In Kona terms last year’s numbers were a reasonable guide to qualification requirements. Solid sub-10 results were the order for those in the major male age groups. 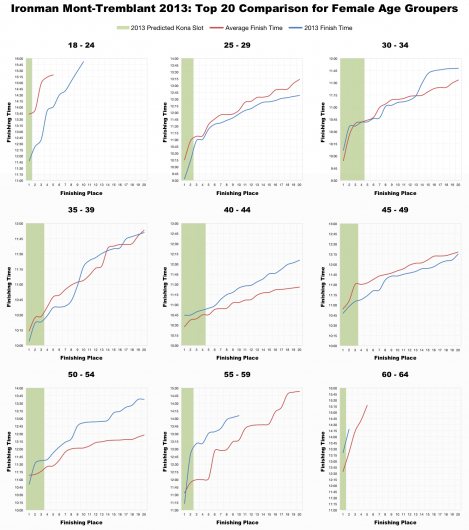 The overall race may be slower, but there was still a decent share of competitive age groupers. 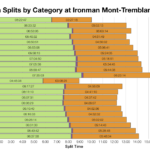 The second year in Mont-Tremblant was clearly slower than the first, but remained ahead of the North American average for Ironman. The front of the age group field was largely on par with the previous year keeping competition for the Kona slots high. Overall Mont-Tremblant falls in line with most other US Ironman races in terms of the field and competition present. 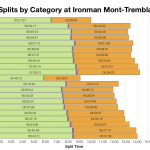 The full results and splits for Ironman Mont-Tremblant 2013 are available from my Google Drive.